Latest program from NYPD initiates teenagers through a curriculum aimed towards helping them gain better emotional intelligence and cub violent scenarios. 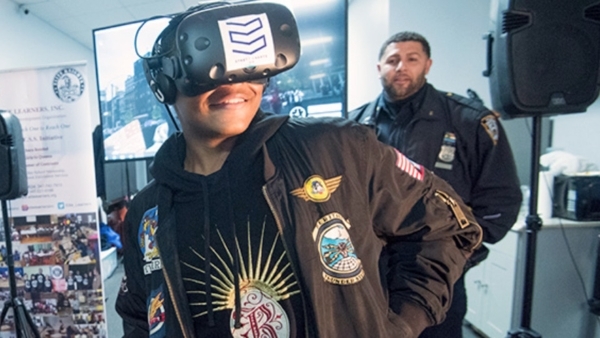 Virtual reality is being utilised by the NYPD for enhancing the lives of teenagers on the street. The New York City Police Foundation, a nonprofit organisation, has contributed $500,000 to the NYPD. The police department’s officials are introducing youngsters to computer-generated simulations. Virtual reality glasses are being used to put the teens through real-life situations, for the purpose of reducing gang violence. The program, titled as “Options”, allows formation of groups comprising ten to fifteen teenagers on average. These individuals are chosen by the NYPD through a curriculum program spanning three days. Participants can exercise theri emotional intelligence skills, which are required to effectively nullify gang member confrontations within their localities. Rodney Harrison, Chief of Patrol at the NYPD, stated that the current program has originated from a previous one, which had teenagers visiting the PD and express their concerns and complaints regarding police services. Right from the start during last year, the department started implementing virtual reality (VR) technology which placed teenagers within computer-generated surroundings. The scenarios involve gang members engaging with the participants with the intention of influencing them. As the gang members try to initiate the participants into their street gangs, they must choose to accept, reject or offer excuses to avoid joining. Det. Jason Anazagasty, NYPD, spoke to reporters during a demonstration of the technology, held at the Manhattan headquarters. He revealed that the scenarios offered through the virtual reality experience are all designed by teenagers themselves. Teenagers from the streets approached the police department themselves. Their accounts of what happens on the streets of crime-heavy areas like East NY, Brooklyn and Brownsville, were used for creating scripts to form the computer generated scenarios. Hassan Dwight, an 18 year old teenager from Brownsville, was present during the demonstration event. He had to put on a virtual reality headset, to enter the setting of a city schoolyard. Dwight faced a scenario with two computer generated gang members, were putting in efforts to imitate another person, a VR friend of Dwight, into the gang. As the video rolled on, it showed the two gang members, a man and a woman, being rejected by the character they were trying to initiate. They eventually walked away as the scene came to an end. The experience and was unnerving for Dwight, despite the scene being computer generated. Anazagasty, who is stationed as a Brooklyn neighbourhood coordination officer, explained that the program was conceptualised to show teenagers how they can get past such escalations. He also added that a particular mode of the experience involved innocent bystanders being knocked down to the ground.